Club Circle East Resort, Borrego Springs, CA. If you are looking for a relaxing Borrego Springs vacation with mid-century flair, you won’t have to look any further. Escape to serenity and sunshine at beautiful Club Circle East Resort, where residential comfort meets hotel convenience amid the magnificent panorama of the Anza Borrego Desert. Our comfortable, fully equipped one and two bedroom condominiums have been expertly maintained for your enjoyment. All of our homes include linens, housekeeping services, WiFi, and a host of other amenities designed to make your desert living experience one you will plan to repeat again and again at a pricing that makes sense to the budget conscious. 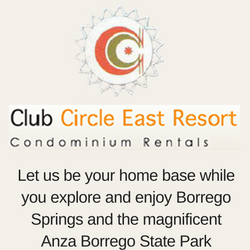 Whether you are traveling individually, as a family, or in a group, Club Circle East Resort welcomes you and our on-site staff, with years of experience in both property management and the lore and legend of the Borrego Desert is prepared to answer your every question. Just ask — we’ll know the answer!